Every week we feature several artists participating in our current exhibit Silent Witnesses: Synagogues Transformed, Rebuilt, or Left Behind - Artists Respond to History. This is an art exhibit organized by the Cultural Heritage Artists Project, in collaboration with the Jewish Art Salon, JWalks and the Holocaust Memorial Center. February 22 - April 14 in Metro Detroit. Exhibit info here. 3 frames 11" x 14" /one video photo frame 5" x 7"
The terrorist attack that occurred in Mumbai (formerly Bombay) on November 26-29, 2008 was a massacre of both resident Indians and visiting foreigners. These attacks brought notice to the world of the existence of a small but ancient group of Indian Jewish people that inhabited the Indian subcontinent for approximately 2,000 years. I was brought up as a Bene Israel Jew in a predominately Hindu and Muslim India in Mumbai, and I was immensely disheartened by the lack of media and news coverage. My American friends asked many questions. “Did Jews first inhabit India upon the establishment of the Chabad house?” “If not, then what did the local Jewish population look like? This dialogue with my friends was the impetus for this proposal. A Fulbright grant has helped me initiate a project to explore and reveal the various Jewish faces of India in a visual art exhibition. 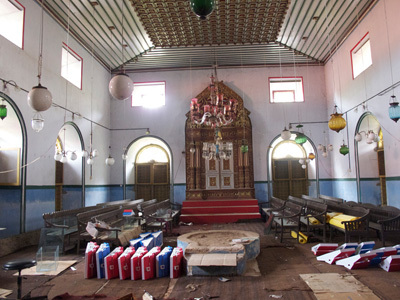 The Kadavumbhagam Synagogue, in Cochin, has been converted into a fish market. The interior of the once beautiful synagogue was in shambles. My project is a video collage of this synagogue accompanied by images around the frame. Are these faces and synagogues from dreams and memories or are they just other faces on passports, immigration cards or perhaps from my family’s photo albums? It is with these faces and their stories that the rest of the world, I hope, will come to know of the Bene Israel Jews in a very transnational India. Siona Benjamin is a painter originally from Bombay, now living in the United States. Her work reflects her background as a Jew in a predominantly Hindu and Muslim India. In her paintings she combines the imagery of her past with her role in America today, making a mosaic inspired by both Indian miniature paintings and Sephardic icons. She received a 2011 Fulbright Fellowship to do research for her art project on the Jews in India. Represented by Flomenhaft Gallery in New York, she has had numerous solo exhibits including Flomenhaft Gallery, the Manhattan JCC, and Princeton University.